THE OBAMA ADMINISTRATION is under pressure to help calm the growing violence in Israel that has some warning of a third intifada, as Israel's military steps up its response to deadly Palestinian attacks by deploying hundreds of troops while Secretary of State John Kerry prepares to visit the region. we can expect nothing better than a political reaming! My son says: "Facebook Is The Devil". I believe it! It's The Golden Rule: They that have the Gold, get to make the rules! Harris, Atty Gen for California (home of some of the newest and most outrageous Gun Control Laws in the nation) embarrassed herself last week when she chided Congress "... " for failing to pass gun control legislation after the mass shooting at Sandy Hook Elementary in 2012." I'm not sure if I'm more amused by her hypocrisy, or admiring of her honesty. Hmmm ... no. Hypocrisy wins, hands down, every time. ALL OF WHICH leads us to surmise that she is one of David Codrea's "Only Ones" who can try it, and not be soiled by the experience. Harris is an elected official. In California. So, you can believe as much of that as you wish. I should have done that years ago, but by now it would have been SO overworked.....! Welcome to Oregon! Now .. please go away! According to reports put out by a pool of White House travel reporters, Obama's motorcade traveled from the local airport to Roseburg High School where he met with families of the deceased. The ride took about 10-15 minutes and he got to the school around 12:45 p.m. There were several hundred people clustered outside the gate to the airport and in the parking lot of a nearby Home Depot. Many of the people were snapping photos with their phones. But others carried signs at this location similar to those lining the highway. About half of the people stationed at this location welcomed Obama to the town. "The other half were negative or seemed to be protesting his calls action to tighten the nation's gun laws," the pool report said. 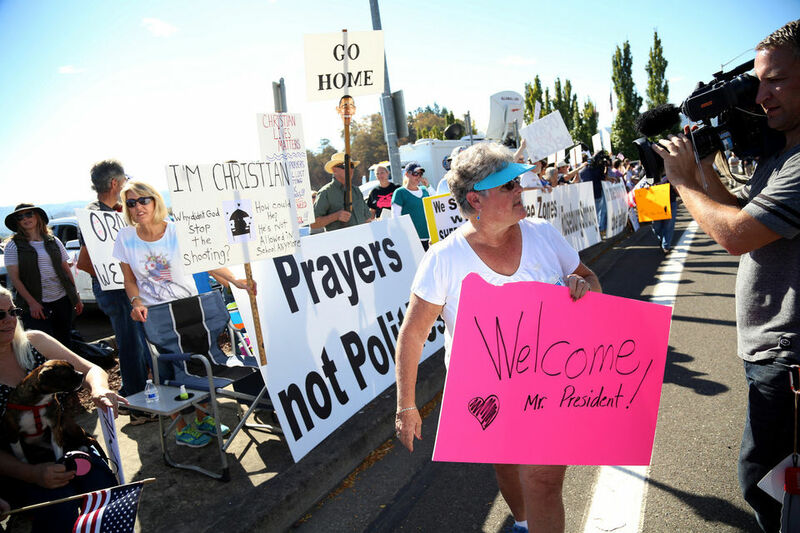 Some of the signs visible from the motorcade: "Please leave us in peace" "Welcome to Roseburg." "We support our Sheriff" "WELCOME" "Gun Free Zones are for sitting ducks" "Obama is wrong" "Nothing Trumps our Liberty" "UCC Strong" for Umqua Community College. Prager often has 'the right of it' ... referring to "Right" as "Correct", not Conservative. But focusing on rightist vs leftist views, Prager still manages to drill down through the issues to touch on the basic differences between one mind-set and another. I won't ask you to RTWT, because I often shy away from these encouragements. "The third reason for the left-right divide on guns is that the two sides ask different questions when formulating social policies. The right tends to ask, “Does it do good?” The left is more likely to ask, “Does it feel good?”"